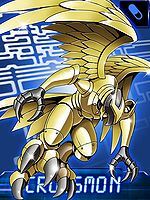 A Giant Bird Digimon whose body is clad in gold armor. The armor that covers its whole body is made of Chrondigizoit, so it deflects every attack. 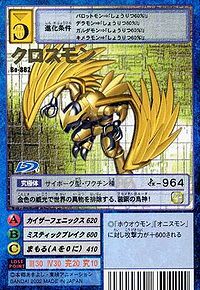 Also, Crossmon is even said to be an evolved form of the Perfect Digimon, Parrotmon. It is said that it is Crossmon's duty to annihilate the invaders that enter the Digital World. 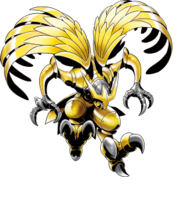 Its Special Moves are performing a ramming attack with its full metal body (Kaiser Phoenix), and a white ray which reduces the opponent to ash (Mystic Break). Crossmon was adopted from a winning Digimon entry in the "Digimon Web Dot-art Contest" which belonged to Mr. Shun Nabetou from Fukuoka prefecture. 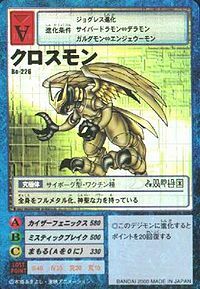 1) n., Cross 「クロス Kurosu」 is a reference to Crossmon's function of monitoring outsiders crossing into the Digital World. | Eagle, a bird of prey. Kaiser Phoenix  カイザーフェニックス Kaizā Fenikkusu C Phoenix/Phoenix Claw Rams with its full metal body. 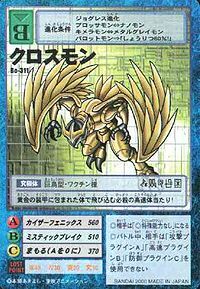 Mystic Break  ミスティックブレイク Misutikku Bureiku Mystic Break Emitts a white beam that reduces the opponent to ashes. Can be evolved from Parrotmon if above level 40 and Bird EXP above 13,000, or can be found at Tropical Islands. Can be evolved from Parrotmon if above level 51, Def 265, above Holy EXP 7500. 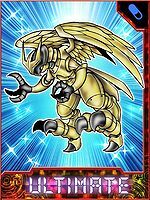 Can also be obtained by Jogressing any combination of Owlmon, Kenkimon, or Shakkoumon if above level 46, Holy EXP above 7000, Defense 300. Crossmon is available as a Digimon Medal. Appears in Area 03 as a boss. Having fully metallicised its body, it possesses a divine power. Covered in golden armor, it flies towards the opponent for a high-speed killer tackle! 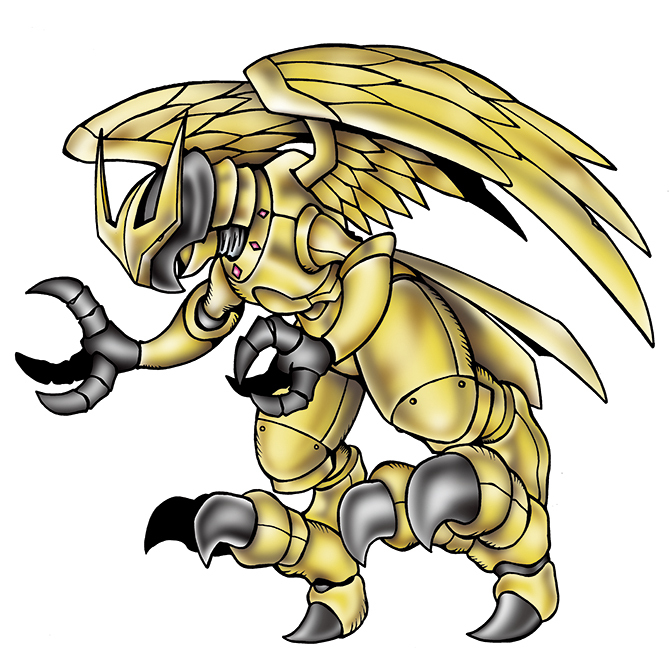 This Full Metal Garuda exterminates foreign bodies from the world with its golden authority! ↑ Crossmon was adopted from a winning Digimon entry in the Second Original Digimon Contest (Digimon Web). This page was last modified on 1 January 2019, at 21:18.